Although iPhone cases, and even mounting systems, have become completely commoditized over the past several years — to the point where we’ve almost entirely stopped doing full reviews of such products — every so often a refreshing new product comes along that’s different enough to pique out interest, so when we saw MyMe’s new Unity Case and Cradle System, we were intrigued. While the concept of a case-and-mount combo is far from a novel idea, MyMe’s solution has a unique design and aesthetic that we rather liked. 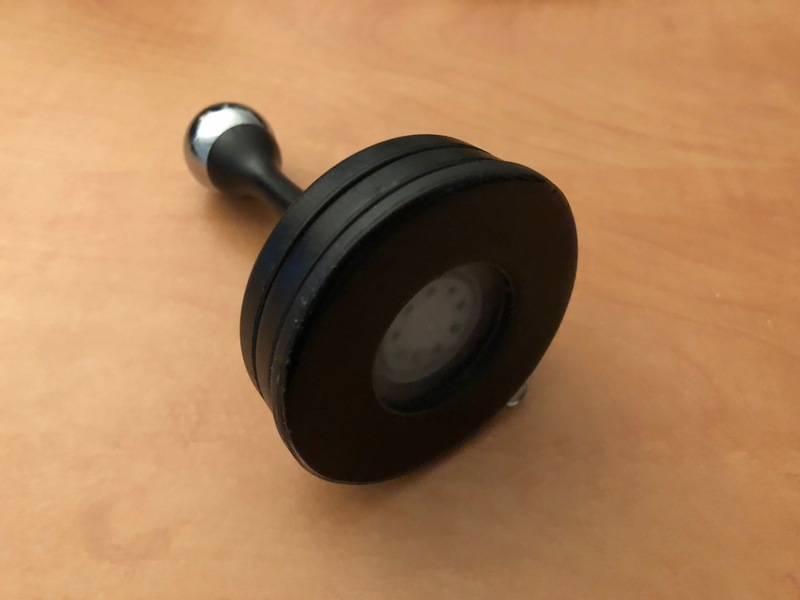 The Unity is the brainchild of award-winning designer Peter Solomon, best known for The Handle electric guitar, and pairs a reasonably protective case with a magnetic cradle that consists of little more than a suction mount on one end and a single metal ball joint on the other. 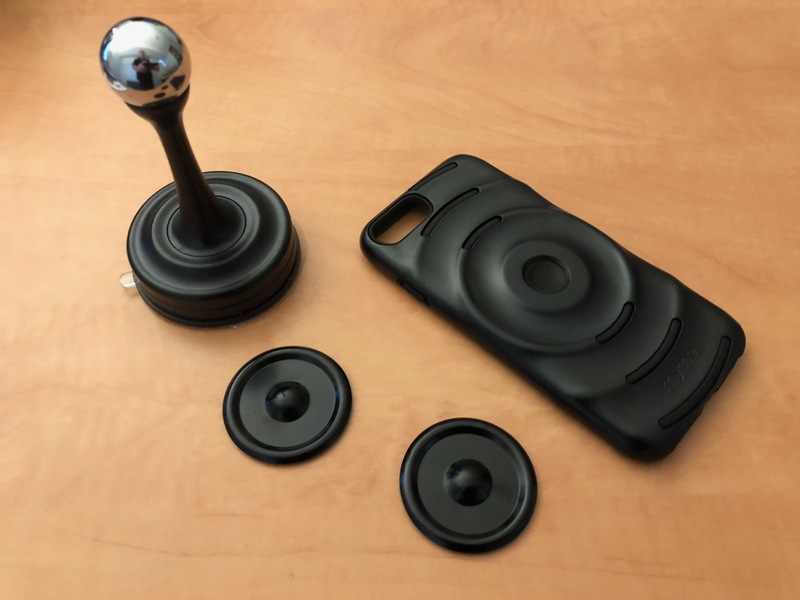 The rear of the case includes a circular magnetic indent that attaches onto the cradle at the ball joint, allowing the encased iPhone to be mounted or oriented in virtually any position or orientation permitted by the laws of physics. Both the case and cradle are available in a fairly wide variety of colors. MyMe sells the Unity System as a package for $35 that includes both the case and the cradle, however the cases and cradles can also be purchased individually, for $25 and $15, respectively, so you can mix and match if you want additional cradles or want to be able to share a single cradle with multiple family members. The case also includes two flat metallic discs with adhesive tape that can be attached to any flat surface for attaching the iPhone to something like a wall or kitchen cabinet, although you’ll likely only need to use the discs for non-metallic surfaces as the magnet in the case itself is strong enough to attach to metallic surfaces such as a refrigerator. The Unity case also sports a unique design of concentric circular ridge patterns that surround the central magnetic mounting hole, adding a nice bit of style to the case that also doubles as a grip. Rubber edges at the peak of each ridge also provide some extra grip, but more importantly keep the case from sliding when attached to a metal surface. 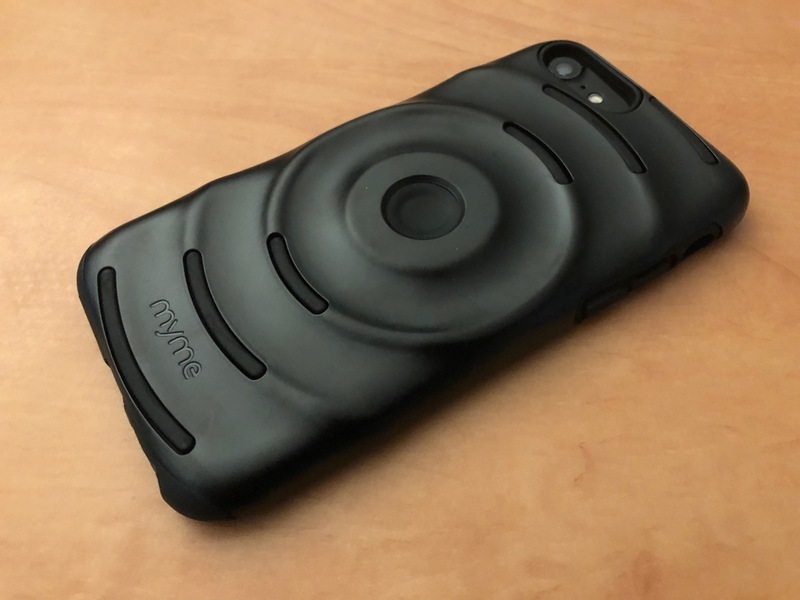 The case itself provides full button and port coverage, dual-layer construction for shock absorption, and a raised lip for screen protection, although MyMe doesn’t rate the case for impact or drop protection. While it’s certainly more protective than most average shell cases, it definitely doesn’t feel as solid as some of the other cases we’ve recently looked at, many of which are designed specifically with drop protection in mind. 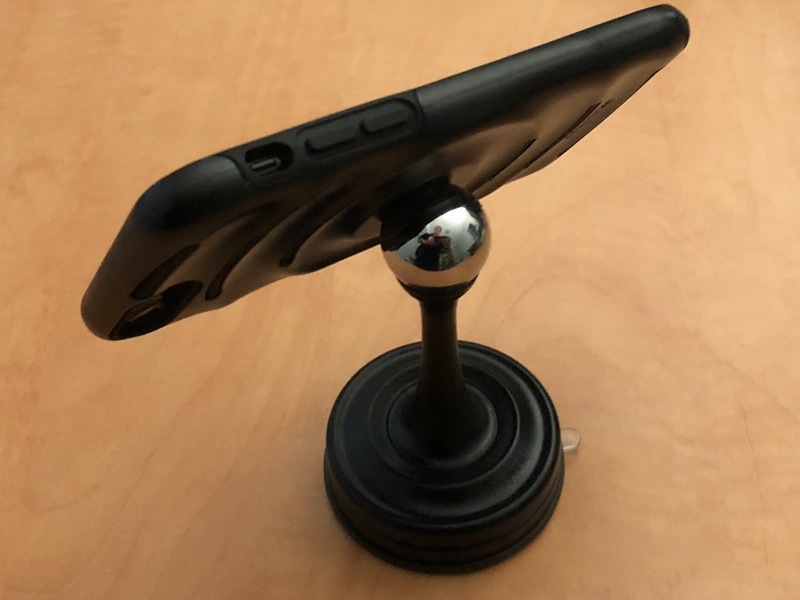 The cradle portion of the system is also available in eight different colors and includes one of the strongest suction cup mounts we’ve seen, allowing to attach very securely to any clean, flat surface, and non-porous surface such as a windshield, mirror, desk, or cabinet. The nature of the metal ball joint and magnetic attachment also means that there’s basically no stress put on the mount when attaching or removing the encased iPhone or moving it around, although the magnet is strong enough that we found that we either needed to pull it off in a rapid motion directly away from the base, or slide a finger around the back to gently separate the case from the ball. In either case, however, the mount stayed very firmly attached to our windshield. It’s a very solid and flexible mount. 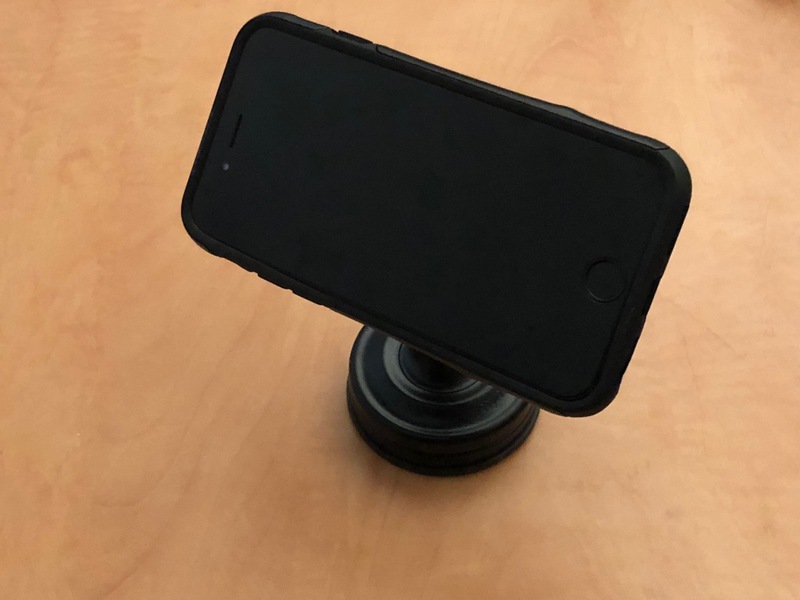 We’re pretty impressed with what MyMe has done here with the Unity System — it’s one of the best mounting solutions we’ve seen for the iPhone and it’s very affordably priced. About the only knock against it is that you of course have to use the case to go along with it, and it’s not a highly protective case, making it a tradeoff between having a great and convenient mounting solution and using your preferred case. However, if you like the look of Unity’s case design and are willing to live with the protection compromise, it’s hard to go wrong with the Unity System.